Pterostilbene has many healthful properties that you discover article after article through your site pterostilbene.com. Some of its healthful properties are not only due to its ability to activate SIRT1, the body’s master regulator of genes involved in longevity. It is also because pterostilbene is able to fight free radicals (or unpaired electrons) and oxidative stress through its ability to up-regulate expression of the body’s two most important endogenous anti-oxidants, glutathione (GSH) and superoxide dismutase (SOD). It does this by activating a master transcription factor, NRF2. Nuclear factor-like 2 (NRF2) is a basic leucine zipper transcription factor. It activates the expression of a number of different genes involved in protecting against oxidative damage. In a healthy, happy cell, NRF2 is kept in the cytoplasm by two proteins, Keap 1 and Collin 3. These two proteins also induce the rapid degradation of NRF2- under normal conditions, it has a half-life of only around 20 minutes. However, when a cell is subjected to oxidative stress, Keap 1 is disabled. NRF2 is then able to translocate into the nucleus and activate the expression of genes critical for protecting the cell. Image source: NRF2 as the master regulator of antioxidant responses. Nat Rev Drug Discov. 2008 Oct;7(10):841-53. doi: 10.1038/nrd2665. NRF2 has many far-reaching effects on the cell (1). One of its major functions is to induce expression of proteins that synthesize glutathione (2). Glutathione is one of the most important natural antioxidants in the body. Other proteins induced by NRF2 synthesize quinones and peroxiredoxins, potent protective agents. NRF2 also induces the expression of multidrug resistance proteins, superoxide dismutase, and heme oxygenase 1. Heme oxygenase 1 plays a critical role in protecting the body against damage from sepsis, hypertension, and ateriosclerosis. NRF2 also induces the production of additional NADPH. NADPH is important forregenerating antioxidants after they have reacted with free radicals. As mentioned above, glutathione (GSH) is one of the most important natural antioxidants in the body. It is synthesized from the amino acids glycine, cysteine, and glutamic acid. GSH acts as a reducing agent by donating electrons, and thus protects the cell against free radicals. Once a GSH molecule de-activates a free radical it becomes oxidized. Oxidized glutathione is converted back to its active form (GSH) through the action of a special protein along with NADPH. The ratio of oxidized to active glutathione is often used as a way to measure the degree of oxidative stress a cell is experiencing. Individuals suffering from systemic stress due to chronic illness, trauma, or athletic over-training are often found to have low levels of GSH in their bodies. Increasing the level of glutathione by activating NRF2 may help individuals resist stress. 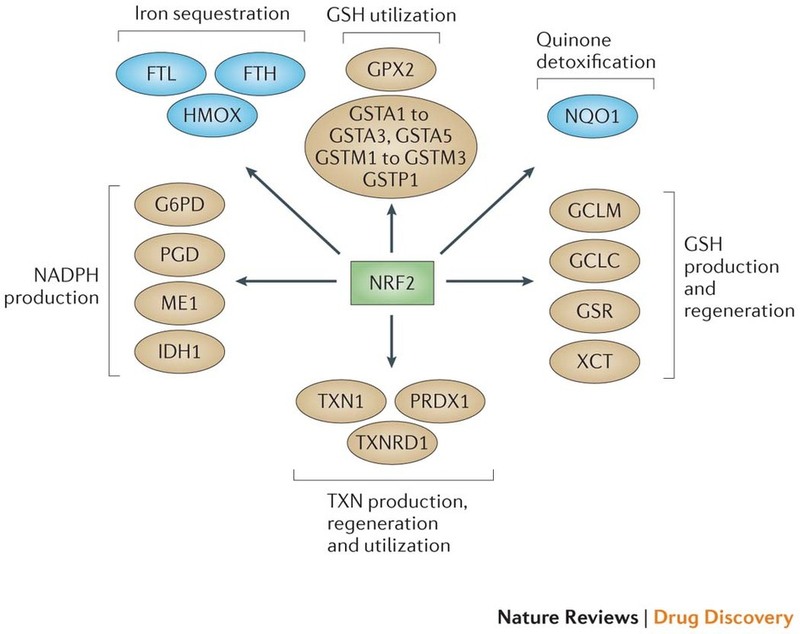 Resveratrol, a chemical very similar to pterostilbene, has been shown to increase the amount of glutathione in the body by activating NRF2 (2). Superoxide dismutase (SOD) is an enzyme that destroys superoxide radicals. It is essential to protect cells from damage caused by the extremely reactive superoxide radical. Mutations in the SOD1 gene cause some familial cases of amyotrophic lateral sclerosis, a neurodegenerative disease. SOD is one of the many protective enzymes that is up-regulated by NRF2 in response to stress. Cardiac cells that have been genetically engineered to lack NRF2 have been shown to be unable to resist damage due to reactive oxygen radicals, presumably due to a deficiency of SOD (3). Activation of NRF2 by agents such as pterostilbene therefore up-regulate the body’s defenses against oxidative damage and free radicals. Once NRF2 has been activated, a cascade of events occur that induce expression of much higher levels of the body’s natural anti-oxidant defenses. These natural anti-oxidants can destroy millions of free radicals per second, providing around-the-clock protection against oxidative damage. This is the only way realistic to fight the 300 sextillion (300 x 1021) free radicals produced by the body every day (amount increased with bad diet and/or environmental attack). Chronic inflammation and oxidative stress have been implicated in most of the chronic diseases of older humans, such as type II diabetes, arteriosclerosis, and cancer. Many studies suggest that activation of NRF2 may be able to protect against these conditions (4). In particular, NRF2 activation has been shown to be able to prevent colorectal cancer in a mouse model (5). In this mouse model of colorectal cancer, NRF2 was activated by pterostilbene or resveratrol. Pterostilbene was found to be a much more potent activator of NRF2 than was resveratrol. Pterostilbene is an all-natural, safe compound manufactured by plants. Inducing NRF2 by taking pterostilbene is a safe way to induce the expression of “survival genes” that help protect the body against oxidative damage and stress. Inducing NRF2 through the use of pterostilbene can help the body function at an optimal level, and may protect against the develop of chronic illnesses. (2) Redox Biol. 2013 Sep 12;1:441-5. doi: 10.1016/j.redox.2013.08.006. eCollection 2013. (3) FEBS Lett. 2005 Jun 6;579(14):3029-36. (4) J Am Coll Nutr. 2015 Jul 7:1-10. (5) J Agric Food Chem. 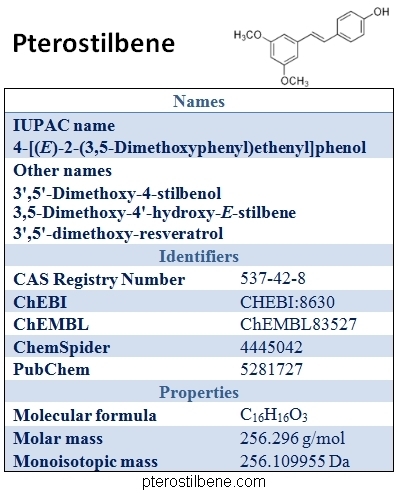 2011 Mar 23;59(6):2725-33. doi: 10.1021/jf2000103. Epub 2011 Feb 28.